Now that the 2018 state assessment scores have finally been released by KSDE, this statement by the Kansas Supreme Court can be, pardon the expression, put to the test. That is because K-12 spending in the 2017-18 school year increased by more than $400 million, a 6.7% increase, to $13,620 per pupil. Despite the spike in spending which was authorized by the Legislature in response to the on-going Gannon case, both groups identified by the Court – the “approximately one-fourth” and the “harder-to-educate” actually performed worse in 2018. 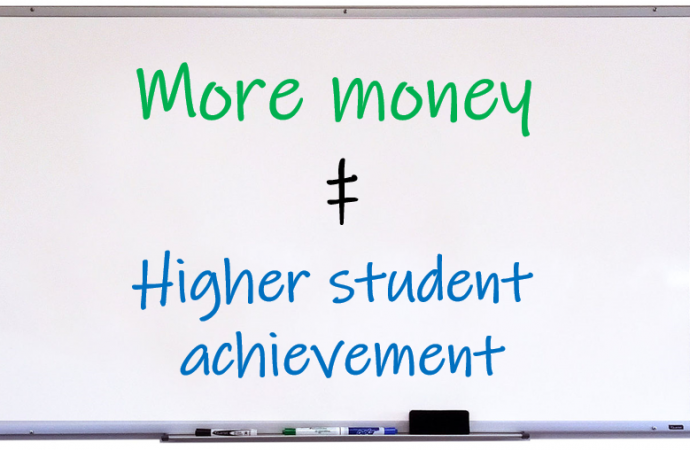 ->From these exhibits and evidence, the district court determined that “yes, money makes a difference,” citing the coincidence of Montoy money and student performance on state assessments. “Student performances/achievements, based on accepted testing methods, evidenced considerable progress, i.e., money was making a difference,” according to the three-justice panel. ->Therefore, the Supreme Court, in looking backward, has concluded a causal relationship exists between spending and student performance, particularly regarding state assessments. It is of particular note that not only did the Court determine a causal relationship, but one in which the impact is immediate. The Kansas Legislature has responded by authorizing an additional funding amount to K-12 education in excess of a billion dollars. The first installment of this court-ordered money was spent in 2017-18. The results of the 2018 state assessments show just how wrong the Supreme Court’s judgment is. During Gannon oral arguments, the Court settled on identifying those students who have scored in Level 1 on Kansas state assessments – the lowest level – as those who are not being provided basic math and reading skills. What was the impact with additional court-ordered funding? That group got bigger. In math, the percentage of students statewide who performed in Level 1 increased from 27.8% to 29.2%. In English language arts (ELA), that percentage increased to 29.2% from 27.4% in 2017. 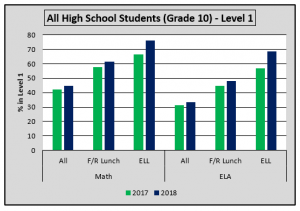 For high school students, a group that has traditionally scored lower overall, the Level 1 ELA percentages increased from 31.2% to 33.3%, while the Level 1 math percentages increased from 42.3% to 44.5%. ->Free and reduced lunch students – those typically considered “at risk”: Level 1 math up from 38.9% to 41.1%, ELA up from 39.4% to 42%. 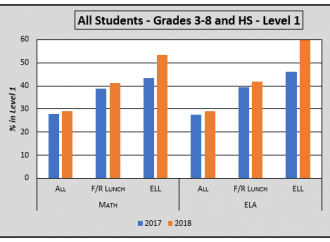 ->ELL students: now over half of ELL students are at Level 1 – 53.3% in math and 59.7% in ELA. That’s a whopping 9.9 percentage point increase in math and a staggering 13.7 percentage point increase in ELA in a single year. Of particular interest is the high school subgroup, because these students are getting close to graduating and either continuing their post-secondary studies or entering the work world. Their performance is lower than overall scores and getting worse. The two graphs provide a visual representation of the failure of more money to increase test scores, just the opposite of what the Kansas Supreme Court has determined. Clearly the Court has gotten it wrong. No longer is this an academic debate. The results are in, and the results don’t lie. There was considerable increase in K-12 education spending followed by a decrease in state assessment scores. This is not to say that more money caused scores to go down, that conclusion would be without proper foundation. Just like the Court’s conclusion that more money causes scores to go up is without proper foundation. 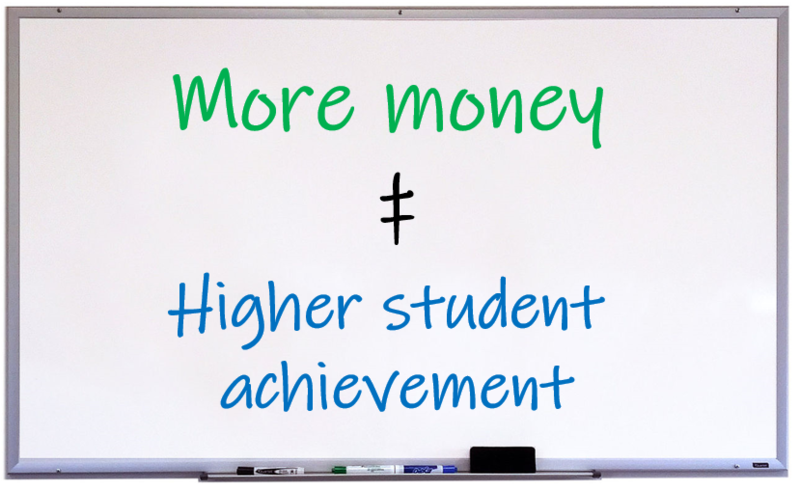 Unfortunately, much higher spending has already kicked-in for the 2018-19 school year and will continue for at least the next several years. KSDE estimates per-pupil spending will be $14,116 when the ink dries from the 2018-19 school year. Even more disturbing is that the Court has determined the additional billion dollars the Legislature has committed in the past two sessions is not enough and the new Legislature will consider adding as much as $364 million to the pot during the next session. Is it any wonder the state assessment results were released absent any fanfare? They were not available to the public until November 13. There was no accompanying press release from KSDE and not even a perfunctory presentation of the data at a state board meeting. An internet search showed zero news articles, newspaper or other media, that presented state assessment results. One can only speculate how those results would have been treated if scores had increased or they were not tied to spending in the on-going Gannon case. Oral arguments pursuant to a Gannon VII decision will be made in the spring. One wonders how plaintiff attorney Alan Rupe is going to try to spin this revelation. Finally, the state will have some evidence to counter the false premise of the court. It’s incumbent on the state solicitor to bring this data to the attention of the justices.